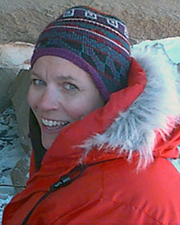 Dr. Edith Taylor studies permineralized fossil plants and their paleoenvironments from the late Paleozoic and early Mesozoic of Antarctica. Evolution of Permian and Triassic plants from Antarctica, based on their anatomy and morphology. In addition, I have a long-standing interest in the structure and evolution of conducting systems in the fossil record, including both xylem and phloem. This work is concerned not only with Permo-Triassic plants from Antarctica, but with representatives from other permineralized floras as well. High latitude fossil floras are an important resource in understanding past climates and plant growth. Since these plants are often living at the limits of their tolerance, they exhibit a sensitive response to climatic variables. The Antarctic fossil plants are preserved as silica permineralizations in fossil peat deposits, so it is possible to study the cell and tissue systems of the plants for comparison with other fossil and living plants. These peat deposits have provided a wealth of new anatomical and morphological information about several Paleozoic and Mesozoic seed plant groups, especially the Glossopteridales (Permian) and the Corystospermales (Triassic). Klymiuk, A. A., C. J. Harper, D. S. Moore, E. L. Taylor, T. N. Taylor, and M. Krings. 2013. "Reinvestigating Carboniferous Actinomycetes: authigenic formation of biomimetic carbonates provides insight into early diagenesis of permineralized plants" PALAIOS. 28. 80-92. Harper, C. J., T. N. Taylor, M. Krings, and E. L. Taylor. 2013. "Mycorrhizal symbiosis in the Paleozoic seed fern Glossopteris from Antarctica" Rev. Palaeobot. Palynol.. 192. 22-31. Bergene, J. A., E. L. Taylor, and T. N. Taylor. 2013. "Dordrechtites arcanus, an anatomically preserved gymnospermous reproductive structure from the Middle Triassic of Antarctica" Intl. J. of Plant Sci.. 174. 250-265. Harper, C. J., B. Bomfleur, A. Decombeix, E. L. Taylor, T. N. Taylor, and M. Krings. 2012. "Tylosis formation and fungal interactions in an Early Jurassic conifer from northern Victoria Land, Antarctica" Rev. Palaeobot. Palynol.. 175. 25-31. Bomfleur, B., H. Kerp, T. N. Taylor, Ø. Moestrup, and E. L. Taylor. 2012. "Triassic leech cocoon from Antarctica contains fossil bell animal" PNAS. 109. 20971-20974. Ryberg, P. E., E. L. Taylor, and T. N. Taylor. 2012. "The first permineralized microsporophyll of the Glossopteridales: Eretmonia mcloughlinii sp. nov" International Journal of Plant Sciences. 173(7). 812-822. Ryberg, P. E., E. L. Taylor, and T. N. Taylor. 2012. "Permineralized lycopsid from the Permian of Antarctica" Review of Palaeobotany and Palynology. 169(1). 1-6. Gulbranson, E. L., J. L. Isbell, E. L. Taylor, P. E. Ryberg, T. N. Taylor, and P. P. Flaig. 2012. "Permian polar forests: deciduousness and environmental variation" Geobiology. 10. 479-495. Taylor, E. L. and T. N. Taylor. 2012. "Paleozoic mosses: Small, but no longer inconspicuous" Geology. 40(8). 767-768. Bomfleur, B., I. H. Escapa, E. L. Taylor, and T. N. Taylor. 2012. "Modified basal elements in Dicroidium fronds (Corystospermales)" Review of Palaeobotany and Palynology. 170(2). 15-26. Krings, M., T. N. Taylor, E. L. Taylor, H. Kerp, H. Hass, N. Dotzler, and C. J. Harper. 2012. "Microfossils from the Lower Devonian Rhynie Chert with suggested affinities to the Peronosporomycetes" Journal of Paleontology. 86(2). 358-367. Decombeix, A., E. L. Taylor, and T. N. Taylor. 2012. "Gymnosperm trees from the Permian of Antarctica: an anatomically preserved trunk of Kaokoxylon sp" Comptes Rendus Palevol. 11. 21-29. Harper, C. J., B. Bomfleur, A. Decombeix, E. L. Taylor, T. N. Taylor, and M. Krings. 2012. "Brown-rot fungal decay and tylosis formation in an Early Jurassic conifer axis from northern Victoria Land, Antarctica" Review of Palaeobotany and Palynology. 175. 25-31. Ryberg, P. E., E. L. Taylor, and T. N. Taylor. 2012. "Antarctic glossopterid diversity at the local level: the presence of multiple megasporophyll genera, Upper Permian, Mt. Achernar, Transantarctic Mountains, Antarctica" American Journal of Botany. 99(9). 1531-1540. Escapa, I. H., E. L. Taylor, R. Cúneo, B. Bomfleur, J. A. Bergene, R. Serbet, and T. N. Taylor. 2011. "Triassic floras of Antarctica: Plant diversity and distribution in high paleolatitude communities" PALAIOS. 26(9). 522-544. Bomfleur, B., R. Serbet, E. L. Taylor, and T. N. Taylor. 2011. "The possible pollen cone of the Late Triassic conifer Heidiphyllum/Telemachus (Voltziales) from Antarctica" Antarctic Science. 23(4). 379-385. Bomfleur, B., E. L. Taylor, T. N. Taylor, R. Serbet, M. Krings, and H. Kerp. 2011. "Systematics and paleoecology of a new peltaspermalean seed fern from the Triassic polar vegetation of Gondwana" International Journal of Plant Sciences. 172(6). 807-835. Decombeix, A., E. L. Taylor, and T. N. Taylor. 2011. "Root suckering in a Triassic conifer from Antarctica: paleoecological and evolutionary implications" American Journal of Botany. 98(7). 1222-1225. Schwendemann, A. B., A. Decombeix, T. N. Taylor, E. L. Taylor, and M. Krings. 2011. "Morphological and functional stasis in mycorrhizal root nodules as exhibited by a Triassic conifer" Proceedings of the National Academy of Sciences, USA. 108(33). 13630–13634. Bomfleur, B., M. Krings, E. L. Taylor, and T. N. Taylor. 2011. "Macrofossil evidence for pleuromeialean lycophytes from the Triassic of Antarctica" Acta Palaeontologica Polonica. 56(1). 195-203. Krings, M., T. N. Taylor, E. L. Taylor, N. Dotzler, and C. Walker. 2011. "Arbuscular mycorrhizal-like fungi in Carboniferous arborescent lycopsids" New Phytologist. 191. 311-314. Taylor, T. N., E. L. Taylor, A. Decombeix, A. B. Schwendemann, R. Serbet, I. H. Escapa, and M. Krings. 2010. "The engimatic Devonian fossil Prototaxites is not a rolled-up liverwort mat: Comment on the paper by Graham et al. 2010 (AJB 97: 268 275)" American Journal of Botany. 97(7). 1074-1078. Taylor, T. N., E. L. Taylor, and C. P. Daghlian. 2010. "The career of Ted Delevoryas: Appreciation and publications" Plants in Mesozoic Time: Innovations, Phylogeny, Ecosystems. edited by Gee, C. T.. xix-xxvi. Decombeix, A., S. D. Klavins, E. L. Taylor, and T. N. Taylor. 2010. "Seed plant diversity in the Triassic of Antarctica: A new anatomically preserved ovule from the Fremouw Formation" Rev. Palaeobot. Palynol.. 158. 272-280. Schwendemann, A. B., T. N. Taylor, E. L. Taylor, and M. Krings. 2010. "Organization, anatomy, and fungal endophytes of a Triassic conifer embryo" American Journal of Botany. 97(11). 1873-1883. Escapa, I. H., B. J. Axsmith, T. N. Taylor, and E. L. Taylor. 2010. "Modifications of the transfer technique for studying complex plant structures" Review of Palaeobotany and Palynology. 159. 62-68. Schwendemann, A. B., T. N. Taylor, E. L. Taylor, M. Krings, and J. M. Osborn. 2010. "Modern traits in early Mesozoic sphenophytes: the Equisetum-like cones of Spaciinodum collinsonii with in situ spores and elaters from the Middle Triassic of Antarctica" Plants in Deep Mesozoic Time: Morphological Innovations, Phylogeny, Ecosystems. edited by Gee, C. T.. 15-33. Escapa, I. H., A. Decombeix, E. L. Taylor, and T. N. Taylor. 2010. "Evolution and relationships of the conifer seed cone Telemachus: Evidence from the Triassic of Antarctica" International Journal of Plant Sciences. 171(5). 560-573. Decombeix, A., E. L. Taylor, and T. N. Taylor. 2010. "Epicormic shoots in a Permian gymnosperm from Antarctica" International Journal of Plant Sciences. 171(7). 772-782. Decombeix, A., E. L. Taylor, and T. N. Taylor. 2010. "Anatomy and affinities of permineralized gymnospermous trunks with preserved bark from the Middle Triassic of Antarctica" Review of Palaeobotany and Palynology. 163(1-2). 26-34. Matysová, P., R. Rössler, J. Götze, J. Leichmann, G. Forbes, E. L. Taylor, J. Sakala, and T. Grygar. 2010. "Alluvial and volcanic pathways to silicified plant stems (Upper Carboniferous– Triassic) and their taphonomic and palaeoenvironmental meaning" Palaeogeography, Palaeoecology, Palaeoclimatology. 292(1-2). 127-143. Serbet, R., I. H. Escapa, T. N. Taylor, E. L. Taylor, and N. R. Cúneo. 2010. "Additional observations on the enigmatic Permian plant Buriadia and implications on early coniferophyte evolution" Review of Palaeobotany and Palynology. 161. 168-178. Schwendemann, A. B., T. N. Taylor, E. L. Taylor, M. Krings, and J. M. Osborn. 2010. "Spaciinodum collinsonii: A Triassic equisetalean cone with spores bearing elaters" Plants in Mesozoic Time: Innovations, Phylogeny, Ecosystems. edited by Gee, C. T.. 17-33. Schwendemann, A. B., A. Decombeix, E. L. Taylor, and T. N. Taylor. 2010. "Collinsonites schopfii gen. et sp. nov., a herbaceous lycopsid from the Upper Permian of Antarctica" Rev. Palaeobot. Palynol.. 158. 291-297. Taylor, E. L. and T. N. Taylor. 2009. "Seed ferns from the late Paleozoic and Mesozoic: Any angiosperm ancestors lurking there?" American Journal of Botany. 96(1). 237-251. Decombeix, A., E. L. Taylor, and T. N. Taylor. 2009. "Secondary growth in Vertebraria roots from the Late Permian of Antarctica: A change in developmental timing" International Journal of Plant Sciences. 170. 644-656. Schwendemann, A. B., T. N. Taylor, and E. L. Taylor. 2009. "Pollen of the Triassic cycad Delemaya spinulosa and implications of cycad evolution" Rev. Palaeobot. Palynol.. 156. 98-103. Taylor, T. N., E. L. Taylor, and M. Krings. 2009. "Paleobotany: The Biology and Evolution of Fossil Plants" (2). 1230. Hermsen, E. J., E. L. Taylor, and T. N. Taylor. 2009. "Morphology and ecology of the Antarcticycas plant" Review of Palaeobotany and Palynology. 153. 108-123. Schwendemann, A. B., T. N. Taylor, E. L. Taylor, M. Krings, and N. Dotzler. 2009. "Combresomyces cornifer from the Triassic of Antarctica: Evolutionary stasis in the Peronosporomycetes" Review of Palaeobotany and Palynology. 154(1-4). 1-5. Ryberg, P. E., E. J. Hermsen, E. L. Taylor, and T. N. Taylor. 2008. "Development and ecological implications of dormant buds in the high-paleolatitude Triassic sphenophyte Spaciinodum (Equisetaceae)" American Journal of Botany. 95(11). 1443-1453. Taylor, E. L. and P. E. Ryberg. 2007. "Tree growth at polar latitudes based on fossil growth ring analysis" Palaeogeography, Palaeoclimatology, Palaeoecology. 255. 246-264. Axsmith, B. J., E. L. Taylor, and T. N. Taylor. 2007. "The 'New Approach to Corystospermales' and the Antarctic Fossil Record: A Critique" Ameghiniana. 44(1). 223-230. Ryberg, P. E., E. L. Taylor, and T. N. Taylor. 2007. "Secondary phloem anatomy of Cycadeoidea (Bennettitales)" American Journal of Botany. 94(5). 791-798. Hermsen, E. J., T. N. Taylor, E. L. Taylor, and D. W. Stevenson. 2007. "Cycads from the Triassic of Antarctica: Permineralized cycad leaves" International Journal of Plant Sciences. 168(7). 1099-1112. Hermsen, E. J., T. N. Taylor, and E. L. Taylor. 2007. "A voltzialean pollen cone from the Triassic of Antarctica" Review of Palaeobotany and Palynology. 144(3-4). 113-122. Krings, M., S. D. Klavins, M. Barthel, S. Lausberg, R. Serbet, T. N. Taylor, and E. L. Taylor. 2007. "Perissothallus, a new genus for Late Pennsylvanian-Early Permian non-calcareous algae conventionally assigned to Schizopteris (aphleboid foliage)" Botanical Journal of the Linnean Society. 153. 477-488. Taylor, E. L., T. N. Taylor, H. Kerp, and E. J. Hermsen. 2006. "The Mesozoic seed ferns: Old paradigms, new discoveries" Journal of the Torrey Botanical Society. 133(1). 62-82. Serbet, R., T. N. Taylor, and E. L. Taylor. 2006. "On a new medullosan pollen organ from the Pennsylvanian of North America" Review of Palaeobotany and Palynology. 142. 219-227. Krings, M., S. D. Klavins, T. N. Taylor, E. L. Taylor, R. Serbet, and H. Kerp. 2006. "Frond architecture of Odontopteris brardii (Pteridospermopsida, ?Medullosales): New evidence from the Upper Pennsylvanian of Missouri, U.S.A." Journal of the Torrey Botanical Society. 133(1). 33-45. Hermsen, E. J., T. N. Taylor, E. L. Taylor, and D. W. Stevenson. 2006. "Cataphylls of the Triassic cycad Antarcticycas schopfii and new insights into cycad evolution" American Journal of Botany. 93(5). 724-738. López-Gómez, J. and E. L. Taylor. 2005. "Preface" Palaeogeography, Palaeoclimatology, Palaeoecology. edited by López-Gómez, J. and E. L. Taylor. 229(1). 1-2. Klavins, S. D., D. W. Kellogg, M. Krings, E. L. Taylor, and T. N. Taylor. 2005. "Coprolites in a Middle Triassic cycad pollen cone: Evidence for insect pollination in early cycads?" Evolutionary Ecology Research. 7(3). 479-488. Taylor, T. N., M. Krings, S. D. Klavins, and E. L. Taylor. 2005. "Protoascon missouriensis, a complex fossil microfungus revisited" Mycologia. 97. 725-729. Krings, M., T. N. Taylor, and E. L. Taylor. 2004. "Structural diversity and spatial arrangement of trichomes in a Carboniferous seed fern" Vistas in Palaeobotany and Plant Morphology: Evolutionary and Environmental Perspectives. edited by Srivastava, P. C.. 61-69. Klavins, S. D., T. N. Taylor, and E. L. Taylor. 2004. "Matoniaceous ferns (Gleicheniales) from the Middle Triassic of Antarctica" Journal of Paleontology. 78(1). 211-217. Taylor, T. N., S. D. Klavins, M. Krings, E. L. Taylor, H. Kerp, and H. Hass. 2004. "Fungi from the Rhynie chert: A view from the dark side" Transactions: Earth Sciences. 94(4). 457-473. Kellogg, D. W. and E. L. Taylor. 2004. "Evidence of oribatid mite detritivory in Antarctica during the Late Paleozoic and Mesozoic" Journal of Paleontology. 78(6). 1146-1153. Axsmith, B. J., R. Serbet, M. Krings, T. N. Taylor, E. L. Taylor, and S. H. Mamay. 2003. "The enigmatic Paleozoic plants Spermopteris and Phasmatocycas reconsidered" American Journal of Botany. 90(11). 1585-1595. Krings, M., H. Kerp, T. N. Taylor, and E. L. Taylor. 2003. "How Paleozoic vines and lianas got off the ground: On scrambling and climbing Late Carboniferous-Early Permian pteridosperms" Botanical Review. 69(2). 204-224. Klavins, S. D., E. L. Taylor, M. Krings, and T. N. Taylor. 2003. "Gymnosperms from the Middle Triassic of Antarctica: The first structurally preserved cycad pollen cone" International Journal of Plant Sciences. 164(6). 1007-1020. Cuneo, N. R., E. L. Taylor, T. N. Taylor, and M. Krings. 2003. "In situ fossil forest from the Upper Fremouw Formation (Triassic) of Antarctica: paleoenvironmental setting and paleoclimate analysis" Palaeoecol., Palaeogeogr., Palaeoclimtol.. 197. 239-261. Klavins, S. D., T. N. Taylor, and E. L. Taylor. 2002. "Anatomy of Umkomasia (Corystospermales) from the Triassic of Antarctica" American Journal of Botany. 89. 664-676. McManus, H. A., E. L. Taylor, T. N. Taylor, and J. W. Collinson. 2002. "A petrified Glossopteris flora from Collinson Ridge, central Transantarctic Mountains: Late Permian or Early Triassic?" Rev. Palaeobot. Palynol.. 120. 233-246. McManus, H. A., L. D. Boucher, E. L. Taylor, and T. N. Taylor. 2002. "Hapsidoxylon terpsichorum gen. et sp. nov., a stem with unusual anatomy from the Triassic of Antarctica" American Journal of Botany. 89. 1958-1966. Rothwell, G. W., E. L. Taylor, and T. N. Taylor. 2002. "Ashicaulis woolfei n. sp., additional evidence for the antiquity of osmundaceous ferns from the Triassic of Antarctica" American Journal of Botany. 89(2). 352-361. Krings, M., H. Kerp, E. L. Taylor, and T. N. Taylor. 2001. "Reconstruction of Pseudomariopteris busquetii a vine-like Late Carboniferous-Early Permian pteridosperm" Amer. J. Bot.. 88. 767-776. Taylor, T. N. and E. L. Taylor. 2001. "Fungi in palaeoecosystems" Palaeobiology II. edited by Briggs, D. E. G. and P. R. Crowther. 464-467. Krings, M., T. N. Taylor, E. L. Taylor, B. J. Axsmith, and H. Kerp. 2001. "Cuticles of Mariopteris occidentalis White nov. emend. from the Middle Pennsylvanian of Oklahoma (USA) and a new type of climber hook for mariopteroid pteridosperms" Review of Palaeobotany and Palynol.. 114(3-4). 209-222. Klavins, S. D., E. L. Taylor, M. Krings, and T. N. Taylor. 2001. "An unusual, structurally preserved ovule from the Permian of Antarctica" Review of Palaeobotany and Palynology. 115(3-4). 107-117. Taylor, E. L. and T. N. Taylor. 2001. "Adolphe Brongniart" Plant Sciences for Students. edited by Robinson, R.. 103-104. Taylor, T. N. and E. L. Taylor. 2000. "The Rhynie chert ecosystem: a model for understanding fungal interactions" Microbial Endophytes. edited by Bacon, C. W. and J. F. White. 31-47. Osborn, J. M., C. J. Phipps, T. N. Taylor, and E. L. Taylor. 2000. "Structurally preserved sphenophytes from the Triassic of Antarctica: reproductive remains of Spaciinodum" Rev. Palaeobot. Palynol.. 111(3-4). 225-235. Taylor, E. L., T. N. Taylor, and N. R. Cúneo. 2000. "Permian and Triassic high latitude paleoclimates: Evidence from fossil biotas" Warm Climates in Earth History. edited by Huber, B. T., K. G. MacLeod, and S. L. Wing. 321-350. Axsmith, B. J., E. L. Taylor, T. N. Taylor, and N. R. Cúneo. 2000. "New perspectives on the Mesozoic seed fern order Corystospermales based on attached organs from the Triassic of Antarctica" American Journal of Botany. 87(6). 757-768. Phipps, C. J., B. J. Axsmith, T. N. Taylor, and E. L. Taylor. 2000. "Gleichenipteris antarcticus gen. et sp. nov. from the Triassic of Antarctica" Review of Palaeobotany and Palynology. 108(1-2). 75-83. Boucher, L. D., E. L. Taylor, and T. N. Taylor. 1999. "Biomechanical stability of Dicroidium pteridosperm foliage" The Evolution of Plant Architecture. edited by Kurmann, M. H. and A. R. Hemsley. 423-435. Archangelsky, A., C. J. Phipps, T. N. Taylor, and E. L. Taylor. 1999. "Paleoazolla, a new heterosporous fern from the Upper Cretaceous of Argentina" American Journal of Botany. 86(8). 1200-1206. Taylor, E. L., T. N. Taylor, N. R. Cúneo, A. Archangelsky, and H. Kerp. 1998. "Seed fern reproductive organs from the Shackleton Glacier area" Antarctic Journal of the U.S.. 31(5). 27-29. Axsmith, B. J., E. L. Taylor, and T. N. Taylor. 1998. "The limitations of molecular systematics: a paleobotanical perspective" Taxon. 47. 105-108. Axsmith, B. J., T. N. Taylor, and E. L. Taylor. 1998. "Anatomically preserved leaves of the conifer Notophytum krauselii (Podocarpaceae) from the Triassic of Antarctica" Amer. J. Bot.. 85. 704-713. Axsmith, B. J., T. N. Taylor, and E. L. Taylor. 1998. "A new fossil conifer from the Triassic of North America: implications for models of ovulate cone scale evolution" International Journal of Plant Science. 159(2). 358-366. Phipps, C. J., T. N. Taylor, E. L. Taylor, N. R. Cuneo, L. D. Boucher, and X. L. Yao. 1998. "Osmunda (Osmundaceae) from the Triassic of Antarctica: an example of evolutionary stasis" Amer. J. Bot.. 85. 888-895. Axsmith, B. J., T. N. Taylor, E. L. Taylor, L. D. Boucher, G. W. Rothwell, and N. R. Cúneo. 1997. "Triassic conifer seed cones from the Lashly Formation, southern Victoria Land" Antarctic Journal of the U.S.. 30(5). 44-46. Taylor, T. N. and E. L. Taylor. 1997. "The distribution and interactions of some Paleozoic fungi" Rev. Palaeobot. Palynol.. edited by Lyons, P. C. and E. L. Zodrow. 95(1-4). 83-94. Zhao, L., T. N. Taylor, and E. L. Taylor. 1997. "Cupulate glossopterid seeds from the Permian Buckley Formation, central Transantarctic Mountains" Antarctic Journal of the U.S.. 30(5). 54-55. Yao, X. L., T. N. Taylor, and E. L. Taylor. 1997. "A taxodiaceous seed cone from the Triassic of Antarctica" Amer. J. Bot.. 84(3). 343-354. Boucher, L. D., E. L. Taylor, T. N. Taylor, N. R. Cúneo, and J. M. Osborn. 1997. "Dicroidium compression floras from southern Victoria Land" Antarctic J. of the U.S.. 30(5). 40-41. Putz, M. K. and E. L. Taylor. 1996. "Wound response in fossil trees from Antarctica" IAWA Journal. 17(1). 77-88. Taylor, T. N., J. M. Osborn, and E. L. Taylor. 1996. "The importance of in situ pollen and spores in understanding the biology and evolution of fossil plants" Palynology: Principles and Applications. edited by Jansonius, J. and D. C. McGregor. 1. 427-441. Cuneo, N. R., T. N. Taylor, and E. L. Taylor. 1996. "Preface--Paleobiology of fossil plants: new insights and perspectives" Rev. Palaeobot. Palynol.. 90. 155-157. Li, H., E. L. Taylor, and T. N. Taylor. 1996. "Permian vessel elements" Science. 271. 188-189. Taylor, E. L.. 1996. "Enigmatic gymnosperms? Structurally preserved Permian and Triassic seed ferns from Antarctica" Rev. Palaeobot. Palynol.. 90. 303-318.
del Fueyo, G. M., E. L. Taylor, T. N. Taylor, and N. R. Cúneo. 1995. "Triassic wood from the Gordon Valley, central Transantarctic Mountains, Antarctica" IAWA Journal. 16(2). 111-126. Del Fueyo, G. M., T. N. Taylor, E. L. Taylor, and N. R. Cuneo. 1995. "Triassic seed fern cupules from Antarctica" Antarctic J. of the U.S.. 29. 30-31. Yao, X. L., T. N. Taylor, and E. L. Taylor. 1995. "The corystosperm pollen organ Pteruchus from the Triassic of Antarctica" Amer. J. Bot.. 82. 535-546. Boucher, L. D., T. N. Taylor, and E. L. Taylor. 1995. "An unusual plant organ from the Triassic of Antarctica" Antarctic J. of the U.S.. 29. 28-29. Del Fueyo, G. M., T. N. Taylor, E. L. Taylor, and N. R. Cúneo. 1994. "Triassic seed fern cupules from Antarctica" Antarctic J. of the U.S.. 29(5). 30-31. Taylor, E. L.. 1994. "Tree rings" McGraw-Hill Yearbook of Science and Technology 1994. 414-416. Taylor, T. N., G. M. Del Fueyo, and E. L. Taylor. 1994. "Permineralized seed fern cupules from the Triassic of Antarctica: Implications for cupule and carpel evolution" Amer. J. Bot.. 81. 666-677. Masood, K. R., T. N. Taylor, T. Horner, and E. L. Taylor. 1994. "Palynology of the Mackellar Formation (Beacon Supergroup) of East Antarctica" Rev. Palaeobot. Palynol.. 83. 329-337. Li, H., B. Tian, E. L. Taylor, and T. N. Taylor. 1994. "Foliar anatomy of Gigantonoclea guizhouensis Gu et Zhi (Gigantopteridales) from the Upper Permian of Guizhou Province, China" Amer. J. Bot.. 81. 382-414. Boucher, L. D., T. N. Taylor, and E. L. Taylor. 1994. "An unusual plant organ from the Triassic of Antarctica" Antarctic J. of the U.S.. 29(5). 28-29. Yao, X. L., T. N. Taylor, and E. L. Taylor. 1993. "The Triassic seed cone Telemachus from Antarctica" Rev. Palaeobot. Palynol.. 78(3-4). 269-276. Taylor, T. N. and E. L. Taylor. 1993. "The Biology and Evolution of Fossil Plants" 982. Taylor, E. L. and T. N. Taylor. 1993. "The ancient forests of Antarctica--response" Antarctic Journal of the U.S.. 28(4). 17-18. Meyer-Berthaud, B., T. N. Taylor, and E. L. Taylor. 1993. "Petrified stems bearing Dicroidium leaves from the Triassic of Antarctica" Palaeontology. 36(2). 337-356. Taylor, T. N., E. L. Taylor, and G. M. del Fueyo. 1993. "Permineralized Triassic plants from Antarctica" The Nonmarine Triassic. edited by Lucas, S. G. and M. Morales. 457-460. Taylor, T. N., E. L. Taylor, T. Horner, and K. R. Masood. 1993. "Palynostratigraphy of the Mackellar Formation (Beacon Supergroup) East Antarctica" Ant. J. of the United States. 28. 32-33. Taylor, E. L. and T. N. Taylor. 1993. "Fossil tree rings and paleoclimate from the Triassic of Antarctica" The Nonmarine Triassic. edited by Lucas, S. G. and M. Morales. 453-455. Boucher, L. D., E. L. Taylor, and T. N. Taylor. 1993. "Dicroidium from the Triassic of Antarctica" The Nonmarine Triassic. edited by Lucas, S. G. and M. Morales. 39-46. Taylor, E. L., R. Cúneo, and T. N. Taylor. 1992. "Permian and Triassic fossil forests from the central Transantarctic Mountains" Antarctic Journal of the U.S.. 26(5). 23-24. Taylor, E. L., T. N. Taylor, and N. R. Cúneo. 1992. "The present is not the key to the past: A polar forest from the Permian of Antarctica" Science. 257. 1675-1677. Taylor, E. L.. 1992. "The occurrence of a Rhexoxylon-like stem in Antarctica" Courier Forschungsinstitut Senckenberg. 147. 183-189. Taylor, E. L. and T. N. Taylor. 1992. "Reproductive biology of the Permian Glossopteridales and their suggested relationship to flowering plants" Proceedings of the National Academy of Sciences, USA. 89. 11495-14497. Delevoryas, T., T. N. Taylor, and E. L. Taylor. 1992. "A marattialean fern from the Triassic of Antarctica" Rev. Palaeobot. Palynol.. 74. 101-107. Taylor, E. L., L. D. Boucher, and T. N. Taylor. 1992. "Dicroidium foliage from Mount Falla, central Transantarctic Mountains" Antarctic Journal of the United States. 27(5). 2-3. Yao, X. L., T. N. Taylor, and E. L. Taylor. 1991. "Silicified dipterid ferns from the Jurassic of Antarctica" Review of Palaeobotany and Palynology. 67. 353-362. Taylor, E. L., R. Cuneo, and T. N. Taylor. 1991. "Permian and Triassic fossil forests from the central Transantarctic Mountains" Ant. J. of the U.S.. 26(5). 23-24. Taylor, E. L. and T. N. Taylor. 1991. "Paleobotany (annual review)" Geotimes. 36(2). 35-36. Farabee, M. J., E. L. Taylor, and T. N. Taylor. 1991. "Late Permian palynomorphs from the Buckley Formation in the central Transantarctic Mountains, Antarctica" Rev. Palaeobot. Palynol.. 69(4). 353-368. Taylor, T. N., E. L. Taylor, B. Meyer-Berthaud, J. L. Isbell, and N. R. Cúneo. 1990. "Triassic osmundaceous ferns from the Allan Hills, southern Victoria Land" Antarctic Journal of the U.S.. 25(5). 18-19. Taylor, E. L. and T. N. Taylor. 1990. "Structurally preserved Permian and Triassic floras from Antarctica" Antarctic Paleobiology: Its Role in the Reconstruction of Gondwana. edited by Taylor, T. N. and E. L. Taylor. 149-163. Taylor, E. L.. 1990. "Phloem evolution: An appraisal from the fossil record" Sieve Elements - Comparative Structure, Induction, and Development. edited by Behnke, H. and R. S. Sjolund. 285-298. Taylor, E. L. and T. N. Taylor. 1990. "Paleobotany (annual review)" Geotimes. 35(2). 44-45. Bose, M. N., E. L. Taylor, and T. N. Taylor. 1990. "Gondwana floras of India and Antarctica - - A survey and appraisal" Antarctic Paleobiology: Its Role in the Reconstruction of Gondwana. edited by Taylor, T. N. and E. L. Taylor. 118-148. Isbell, J. L., T. N. Taylor, E. L. Taylor, N. R. Cúneo, and B. Meyer-Berthaud. 1990. "Depositional setting of Permian and Triassic fossil plants in the Allan Hills, southern Victoria Land" Antarctic Jour. of the U.S.. 25(5). 22. Farabee, M. J., E. L. Taylor, and T. N. Taylor. 1990. "Correlation of Permian and Triassic palynomorph assemblages from the central Transantarctic Mountains, Antarctica" Review of Palaeobotany and Palynology. 65. 257-265. Faure, G., T. M. Mensing, and E. L. Taylor. 1990. "Carbon isotope composition of Permian and Triassic plants in silicified peat, Transantarctic Mountains" Antarctic Jour. of the U.S.. 25(5). 26-27. Taylor, E. L. and T. N. Taylor. 1990. "Bibliography of Antarctic paleobotany and palynology" Antarctic Paleobiology: Its Role in the Reconstruction of Gondwana. edited by Taylor, T. N. and E. L. Taylor. 221-246. Taylor, E. L., T. N. Taylor, B. Meyer-Berthaud, J. L. Isbell, and N. R. Cúneo. 1990. "A Late Triassic flora from the Allan Hills, southern Victoria Land" Antarctic Jour. of the U.S.. 25(5). 20-21. Meyer-Berthaud, B., E. L. Taylor, and T. N. Taylor. 1992. "Reconstructing the Gondwana seed fern Dicroidium: Evidence from the Triassic of Antarctica" Géobios. 25(3). 341-344. Taylor, T. N. and E. L. Taylor. 1992. "Permian plants from the Ellsworth Mountains, West Antarctica" Geology and Paleontology of the Ellsworth Mountains. edited by Webers, G. F., C. Craddock, and J. F. Splettstoesser. 285-294. Taylor, T. N. and E. L. Taylor. 1989. "The lush vegetation of Antarctica" Plants Today. 2(4). 116-120. Perovich, N. E. and E. L. Taylor. 1989. "Structurally preserved fossil plants from Antarctica. IV. Triassic ovules" Amer. J. Bot.. 76(7). 992-999. Farabee, M. J., T. N. Taylor, and E. L. Taylor. 1989. "Pollen and spore assemblages from the Falla Formation (Upper Triassic), central Transantarctic Mountains, Antarctica" Rev. Palaeobot. Palynol.. 61. 101-138. Taylor, T. N., E. L. Taylor, and J. L. Isbell. 1989. "Glossopterid reproductive organs from Mt. Achernar, Antarctica" Antarctic Jour. of the U.S.. 24(5). 28-30. Taylor, E. L., T. N. Taylor, J. L. Isbell, and N. R. Cúneo. 1989. "Fossil floras of Southern Victoria Land - 2. Kennar Valley" Antarctic Jour. of the U.S.. 24(5). 26-28. Taylor, E. L., T. N. Taylor, J. L. Isbell, and N. R. Cúneo. 1989. "Fossil floras of Southern Victoria Land - 1. Aztec Mountain" Antarctic Jour. of the U.S.. 24(5). 24-26. Taylor, E. L., T. N. Taylor, and J. W. Collinson. 1989. "Depositional setting and paleobotany of Permian and Triassic permineralized peat from the central Transantarctic Mountains, Antarctica" International Jour. of Coal Geology. 12. 657-679. Taylor, E. L.. 1988. "Secondary phloem anatomy in cordaitean axes" American Journal of Botany. 75(11). 6175-6188. Taylor, T. N., E. L. Taylor, and M. J. Farabee. 1988. "Palynostratigraphy of the Falla Formation (Upper Triassic), Beardmore Glacier Region" Antarctic Jour. of the U.S.. 23(5). 8-9. Taylor, T. N., E. L. Taylor, and M. J. Farabee. 1988. "Palynostratigraphy of the Buckley Formation (Permian), central Transantarctic Mountains" Antarctic Jour. of the U.S.. 23(5). 21-23. Taylor, E. L. and T. N. Taylor. 1988. "Late Triassic flora from Mount Falla, Queen Alexandra Range" Antarctic J. of the U.S.. 23(5). 2-3. Taylor, T. N. and E. L. Taylor. 1987. "The ultrastructure of fossil gymnosperm pollen" Bull. Soc. Bot. de France. 134(2). 121-140. Millay, M. A., T. N. Taylor, and E. L. Taylor. 1987. "Studies of Antarctic fossil plants: An association of ferns from the Triassic of Fremouw Peak" Antarctic Journal of the U.S.. 22(5). 31-32. Taylor, T. N. and E. L. Taylor. 1987. "Structurally preserved fossil plants from Antarctica. III. Permian seeds" Amer. J. Bot.. 74. 904-913. Taylor, T. N. and E. L. Taylor. 1987. "An unusual gymnospermous reproductive organ of Triassic age" Antarctic Journal of the U.S.. 22(5). 29-30. Millay, M. A., T. N. Taylor, and E. L. Taylor. 1987. "Phi thickenings in fossil seed plants from Antarctica" IAWA Bull.. 8(3). 191-201. Taylor, E. L., T. N. Taylor, J. W. Collinson, and D. H. Elliot. 1986. "Structurally preserved Permian plants from Skaar Ridge, Beardmore Glacier region" Antarctic Journal of the U.S.. 21(5). 27-28. Taylor, T. N., E. L. Taylor, and J. W. Collinson. 1986. "Paleoenvironment of Lower Middle Triassic plants from the Fremouw Formation" Antarctic Journal of the U.S.. 21(5). 26-27. Smoot, E. L. and T. N. Taylor. 1987. "Antarctic research (letter to the editor)" Nature. 325. 10. Smoot, E. L. and T. N. Taylor. 1986. "Structurally preserved fossil plants from Antarctica. II. A Permian moss from the Transantarctic Mountains" Amer. J. Bot.. 73(12). 1683-1691. Smoot, E. L. and M. Van de Wege. 1986. "Phloem anatomy in Stauropteris biseriata from the Pennsylvanian of North America" Amer. J. Bot.. 73(7). 1041-1046. Taylor, T. N. and E. L. Smoot. 1986. "Field guide to fossil plants of eastern Kentucky" Field Excursion 6, Carboniferous of eastern Kentucky, Guidebook. edited by Haban, S. M.. 153-172. Smoot, E. L. and T. N. Taylor. 1986. "Evidence for simple polyembryony in Permian seeds from Antarctica" Amer. J. Bot.. 73. 1079-1081. Smoot, E. L., T. N. Taylor, and T. Delevoryas. 1985. "Structurally preserved fossil plants from Antarctica. I. Antarcticycas, gen. n., a Triassic cycad stem from the Beardmore Glacier area" Amer. J. Bot.. 71. 410-423. Taylor, T. N. and E. L. Smoot. 1985. "Plant fossils from the Ellsworth Mountains" Antarctic Journal of the U.S.. 20(5). 48-49. Smoot, E. L.. 1985. "Phloem anatomy of the Carboniferous coenopterid ferns Anachoropteris and Ankyropteris" Amer. J. Bot.. 72(2). 191-208. Taylor, T. N. and E. L. Smoot. 1985. "Fossil plants from the Pennspylvanian of eastern Kentucky" Carboniferous of Eastern Kentucky. edited by Haban, S. M.. 153-172. Taylor, T. N. and E. L. Smoot. 1985. "A new Triassic cycad from the Beardmore Glacier area of Antarctica" Antarctic Journal of the U.S.. 20(5). 5-7. Smoot, E. L. and T. N. Taylor. 1984. "The fine structure of fossil plant cell walls" Science. 225. 621-623. Smoot, E. L.. 1984. "Secondary phloem anatomy in Callistophyton boyssetii (Renault) Rothwell and histological changes in the outer phloem" Botanical Gazette. 145(3). 395-406. Smoot, E. L.. 1984. "Phloem structure in the Carboniferous fern Psaronius (Marattiales)" Amer. J. Bot.. 71(8). 1104-1113. Smoot, E. L.. 1984. "Phloem anatomy of the Carboniferous pteridosperm Medullosa and evolutionary trends in gymnosperm phloem" Botanical Gazette. 145(4). 550-564. Taylor, T. N. and E. L. Smoot. 1984. "Fossil plants from the Beardmore Glacier area" Antarctic Journal of the U.S.. 19(5). 12. Smoot, E. L. and T. N. Taylor. 1983. "Studies of Carboniferous pteridosperm seeds: The relationship of the integument and nucellus in Pachytesta gigantea" Rev. Palaeobot. Palynol.. 40. 165-176. Taylor, T. N. and E. L. Smoot. 1983. "Structurally preserved plants from the Beardmore Glacier area" Antarctic Journal of the U.S.. 18(5). 57-58. Smoot, E. L. and T. N. Taylor. 1985. "Paleobotany: Recent developments and future research directions" Palaeogeography, Palaeoclimatology, Palaeoecology. 50. 149-162. Smoot, E. L. and T. N. Taylor. 1983. "Filamentous microorganisms from the Carboniferous of North America" Can. J. Bot.. 61. 2251-2256. Smoot, E. L., T. N. Taylor, and B. S. Serlin. 1982. "Archaeocalamites from the Upper Mississippian of Arkansas" Rev. Palaeobot. Palynol.. 36. 325-334. Smoot, E. L. and T. N. Taylor. 1981. "The petrified pteridosperm stem Medullosa anglica from the Pennsylvanian of North America" Palaeontology. 24. 647-653. Cichan, M. A., T. N. Taylor, and E. L. Smoot. 1981. "The application of SEM in the characterization of Carboniferous lycopod wood" 197-201. Cichan, M. A., T. N. Taylor, and E. L. Smoot. 1981. "The application of scanning electron microscopy in the characterization of Carboniferous lycopod wood" Scanning Electron Microscopy. 1981. 197-201. Smoot, E. L., R. K. Jansen, and T. N. Taylor. 1981. "A phylogenetic analysis of the land plants: A botanical commentary" Taxon. 30. 65-67. Smoot, E. L.. 1979. "The phloem of Etapteris leclercqii and Botryopteris tridentata" Amer. J. Bot.. 66. 511-521. Smoot, E. L. and T. N. Taylor. 1978. "Sieve areas in fossil phloem" Science. 202. 1081-1083. Smoot, E. L. and T. N. Taylor. 1978. "Etapteris leclercqii n. sp., a zygopterid fern from the Pennsylvanian of North America" Amer. J. Bot.. 65. 571-576. Smoot, E. L. and T. N. Taylor. 1981. "Phloem histology of a Lower Pennsylvanian Psaronius" Palaeobotanist. 28-29. 81-85. For people that are going into the ‘deep field,’ i.e., people like our field party that will go away from the station and camp out somewhere, there is a food warehouse where you pack the food you’ll need for your field stay. If you are not very far away from McMurdo Station, you can get resupplied with food if a helicopter is going that way (see note above about frozen food). Since we don’t hike into our camping sites, we can take frozen, canned, and dried food. For people staying in McMurdo, there is a cafeteria where everyone eats and the food is plentiful and very good. They say you burn almost 3000 calories/day just keeping warm, so food is very important for your survival! The US National Science Foundation provides almost all the clothing, food, and camping gear you will need in Antarctica. There is a clothing warehouse in Christchurch, New Zealand (the place we fly from to reach continental Antarctica), where each field party member tries on the cold weather gear before they go to the field. In McMurdo, your gear is waiting for you (put together by workers that are there during the winter) to check out and make sure it is what you need, e.g., you check your tents to make sure there are no holes (see below). Fieldwork takes place in what is fall in the Northern Hemisphere, but spring in the Southern. The fall in the Northern Hemisphere is spring in the Southern. In Antarctica, there are 24 hrs of light during the summer. The sun rises to only about 10 o’clock high and moves around in a circle during the 24 hrs. In the winter, it is too cold to do fieldwork and it is dark 24 hrs/day. In the summer in the Transantarctic Mountains, where we do fieldwork, it is usually around –30° F in the summer and can be –70-90° in the winter. The U.S. has 3 permanent stations on the Ice (as it’s called): McMurdo, South Pole and Palmer (on Antarctic Peninsula). McMurdo has around 250 people that ‘winter over’ and around 1000 there in the summer.